Randy has been serving our rural Oregon coastal community since 1994. He started as a volunteer firefighter at Coos Bay Fire Department and quickly discovered his passion for EMS. Randy then started his EMS career, first earning his EMT Basic then his EMT Intermediate while volunteering with the Coos Bay Fire Department. Randy started with Bay Cities Ambulance in November 2002. He worked his first six years as an EMT Intermediate, often being the primary caregiver, and refined his skills and knowledge. Then in 2007, Randy started the hard work that resulted in his earning his AA degree in paramedicine in 2009. Since becoming a licensed Paramedic with Bay Cities Ambulance, Randy has continued to advance in his chosen profession, progressing to Field Training Office and then Paramedic Supervisor. Now in his 15th year with Bay Cities, Randy has advanced to Administrative Supervisor. In that role he has numerous different responsibilities, including helping to establish our Community Paramedic Program. 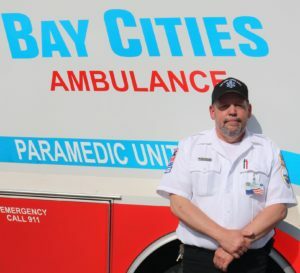 We are privileged to have Randy as part of our team here at Bay Cities Ambulance, and, as the organization continues to grow, we’re excited to watch Randy grow with us.